A certain suave distinction sets Luigi Bormioli glassware apart. That’s because Luigi Bormioli glassware hails from Parma in Italy, nestled halfway between Bologna and Milan. The history of this region can be traced back to the ancient Etruscans, who excelled in sculpting and terracotta artworks, and today this same area carries a name for being a centre of art, music and glassmaking. Really, where else in Italy would you expect Luigi Bormioli to begin their business? Since the ‘40s, Luigi Bormioli have focused on great design, traditional Italian craftsmanship, and modern glassmaking technology to create distinct glassware that looks as clear and elegant as crystal, but retains the strength and durability of glass. It’s beautiful. Perfect. A Masterpiece. This isn’t the kind of Masterpiece you hang from your wall, though. Luigi Bormioli’s Masterpiece collection is among their most elegant. Keep it for those special occasions when you have an impression to make, or use it every day – it’s up to you to make use of this artwork. Made from crystal glass – it’s ultra-bright, like crystal, but with the tough durability of glass. 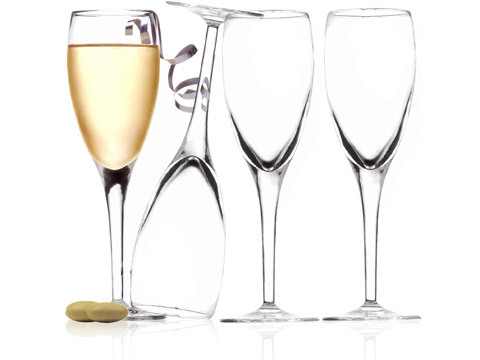 Presented as a set of four glasses.